The nephrotic syndrome is defined by a urinary protein level exceeding 3.5 g per 1.73 m2 of body surface area per day. The term is still clinically useful and has persisted, because heavy proteinuria, irrespective of its origin, is associated with a spectrum of clinically important sequelae, sodium retention, hyperlipoproteinemia, infection and thrombo-embolic complications. Coronary heart disease is an important cause of morbidity and mortality in patients with chronic renal disease. The high CHD prevalence in these patients is likely related to their high frequency of hyperlipidemia. The characterization of the degree of type of lipid and lipoprotein abnormalities should therefore be considered important in the management of patients to prevent CHD. It has also been suggested that dyslipidemia may contribute to accelerate development of renal insufficiency. There is a variable increase in the levels of VLDL, IDL (intermediate density lipoprotein) and LDL fractions resulting in elevated serum cholesterol alone or in simultaneous elevation of serum cholesterol and triglycerides. Hypertriglyceridemia are associated with accumulation of chylomicron remnants and VLDL remnants which are also very atherogenic. Hypertriglyceridemia generates small dense LDL particles and is associated with low HDL-c. It is also associated with increased coagulability and decreased fibrinolysis by its association with increased levels of PAI-1 and factor VIIc activation of prothrombin to thrombin. HDL looks the missing link, persons with low HDL particles have a higher risk to lose their renal functions. The higher the ratio of low-density lipoproteins to high-density lipoproteins found in chronic-dialysis and renal-transplant patients may be related to their premature morbidity and mortality from cardiovascular causes. HDL structures and properties are discussed in function of their protective effects. HDL-c is now emerging as a key entity in both determining risk and providing protection although none as yet specifies HDL as target for treatment. Chronic renal failure (CRF) results in profound lipid disorders, which stem largely from dysregulation of high density lipoproteins (HDL) and triglyceride-rich lipoprotein metabolism. Specifically, maturation of HDL is impaired and its composition is altered in CRF. In addition, clearance of triglyceride-rich lipoproteins and their atherogenic remnants is impaired, their composition is altered, and their plasma concentrations are elevated in CRF. Impaired maturation of HDL in CRF is primarily due to down regulation of lecithin-cholesterol-acyltransferase and, to a lesser extent, increased plasma cholesteryl ester transfer protein (CETP). Triglyceride enrichment of HDL in CRF is primarly due to hepatic lipase deficiency and elevated CETP activity. The CRF induced hypertriglyceridemia, abnormal composition, and impaired clearance of triglyceride-rich lipoproteins and their remnants are primarily due to down regulation of lipoprotein lipase, hepatic lipase, and the very low density lipoprotein receptor, as well as, up regulation of hepatic acyl-CoA cholesterol acyltransferase (ACAT). In addition, impaired HDL metabolism contributes to the disturbance of triglyceride-rich lipoprotein metabolism. These abnormalities are compounded by down regulation of apolipoproteins apoA-I, apoA-II and apoC-II in CRF. Together, these abnormalities may contribute to the risk of atherosclerotic cardiovascular disease and may adversely affect progression of renal disease and energy metabolism in CRF. Two mechanisms contribute to nephrotic dyslipidemia: overproduction and impaired catabolism of apolipoproteine B-containing lipoproteins, decreased catabolism of chylomicrons and VLDL has been documented in the nephrotic syndrome. It is probable that abnormal lipoprotein catabolism results, at least in part, from urinary loss of some substances. The common features of dyslipidemia of CRF and their modifications by heavy proteinuria and dialytic modalities are summarized in Table 8.1. CKD, chronic kidney disease; ESRD, end-stage renal disease; LDL, IDL, HDL: low-density, intermediate-density, and high-density lipoproteins, respectively; apo, apolipoprotein. Plasma triglyceride concentration is frequently elevated in patients and experimental animals with CRF. However, plasma cholesterol concentration is usually normal, even reduced, and only occasionally elevated in patients with end-stage renal disease (ESRD). Elevation of plasma triglycerides in ESRD patients is accompanied by increased plasma concentration and impaired clearance of VLDL. This is associated with the accumulation of atherogenic VLDL remnants, commonly known as IDL. Similarly, clearance of chylomicrons is impaired and plasma concentration of chylomicron remnants is elevated in CRF patients. In contrast, plasma concentration of LDL is usually normal and only occasionally elevated in ESRD patients. Plasma HDL concentration is consistently reduced, and maturation of cholesterol ester-poor HDL-3 to cholesterol ester-rich cardio protective HDL-2 is impaired in CRF. As noted earlier, CRF is consistently associated with reduced plasma HDL cholesterol concentration, impaired maturation of cholesterol ester-poor HDL-3 to cholesterol ester-rich HDL-2, increased HDL triglycerides, and depressed plasma apoA-I. These abnormalities are primarily due to CRF-induced dysregulation of several important proteins, which are briefly described below. (Table 8.2.). LP, lipoprotein; LCAT, lecithin cholesterol acyltransferase; CETP, cholesterol ester transfer protein; ACAT, acyl-CoA cholesterol acyltransferase; DGAT, acyl-CoA diacylglycerol acyltransferase; TG, triglyceride; Chol, cholesterol; LPL, lipoprotein lipase; LRP, LDL receptor-related protein; CM, chylomicron. LCAT plays an important role in HDL-mediated cholesterol uptake from the extrahepatic tissues and, as such, serves as a main determinant of HDL maturation and plasma HDL cholesterol level. Thus LCAT deficiency can potentially account for diminished plasma HDL cholesterol and impaired HDL maturation in CRF. In fact, plasma LCAT activity is consistently diminished in patients with ESRD. This is accompanied by a significant elevation of plasma-free cholesterol and a marked reduction in plasma esterified cholesterol concentration, providing functional evidence for diminished LCAT-dependent cholesterol esterification. 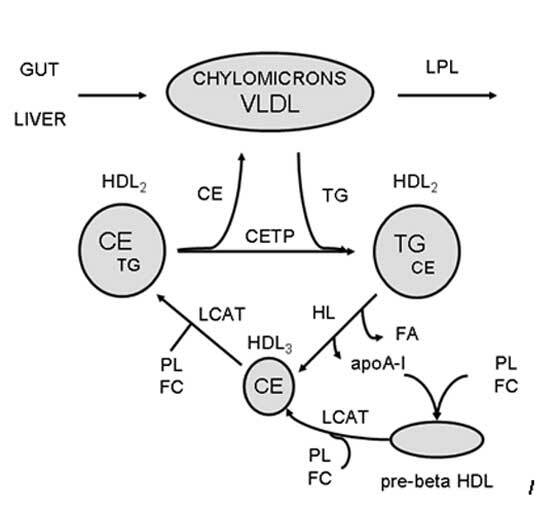 CETP mediates transfer of cholesterol ester from HDL to IDL in exchange for triglycerides. Thus a potential increase in plasma CETP can contribute to the CRF-associated reduction in HDL cholesterol ester and elevation of HDL triglycerides. In fact, according to a recent study, more than 34% of hemodialysis-dependent patients were found to have high plasma CETP levels. The mechanism responsible for the reported elevation of CETP in ESRD patients is unknown and requires future investigation. The effect of CRF is amplified by proteinuria, which has been shown to increase synthesis and markedly raise plasma concentration of CETP. Thus plasma CETP is expectedly elevated in patients with heavy proteinuria and mild to severe renal insufficiency. Hepatic lipase. Hepatic lipase catalyzes hydrolysis and removal of the triglyceride content of HDL. Thus hepatic lipase deficiency can potentially contribute to increased HDL triglyceride content. In fact, as described later (abnormalities of lipoprotein remnants), CRF results in pronounced hepatic lipase deficiency in humans and experimental animals. apoA-I and apoA-II. apoA-1 and apoA-II constitute the main structural constituents of HDL. In addition, apoA-I serves as the LCAT activator as well as ligand for the SRB-1 and HDL binding protein (ABCA1 transporter), whereas apoA-II serves as the hepatic lipase activator. Plasma concentrations of apoA-I and apoA-II are significantly reduced in patients with ESRD. Studies in animals with experimental CRF have demonstrated that the CRF-induced reduction in plasma apoA-I is due to down regulation of hepatic apoA-I gene expression. The reduction in plasma concentration of these important constituents can, therefore, contribute to both diminished plasma HDL concentration and impaired HDL function in CRF. SRB-1. Hepatic SRB-1 is the primary pathway for disposal of HDL-borne cholesterol ester and triglycerides. Therefore, potential dysregulation of this protein can impact HDL metabolism. Heavy glomerular proteinuria has been shown to significantly reduce hepatic SRB-1 protein expression in experimental animals. In contrast, CRF per se, without heavy proteinuria, induced by nephrectomy, does not significantly change SRB-1 mRNA or protein abundance in the liver. However, concomitant heavy proteinuria and renal insufficiency may affect SRB-1 expression and hence, HDL-mediated reverse cholesterol transport. ACAT. HDL-mediated cholesterol uptake from the extrahepatic tissues depends on deesterification of cholesterol esters contained in the intracellular vesicles and the resultant release of free cholesterol. This process is opposed by ACAT, which is the main enzyme for intracellular esterification of cholesterol. Therefore, a relative increase in ACAT activity can potentially limit HDL-mediated cholesterol uptake and, hence, contribute to the reduction in plasma HDL cholesterol and impaired maturation of HDL. Although the effect of CRF on ACAT expression and activity in the extrahepatic tissues is not known, CRF has been recently shown to markedly raise hepatic ACAT-2 mRNA and protein abundance, as well as total ACAT activity. The potential contribution of ACAT to the CRF-induced dysregulation of HDL metabolism was illustrated by a recent study which revealed that pharmacological inhibition of ACAT results in a dramatic shift in plasma cholesterol from apoB-containing lipoproteins to HDL with virtually no change in plasma total cholesterol in CRF animals. Interestingly, the improvement in the lipid profile with an ACAT inhibitor was accompanied by a significantly higher creatinine clearance in the treated than the untreated animals. This phenomenon may be due to amelioration of dyslipidemia and enhanced HDL-mediated reverse cholesterol transport, leading to attenuation of glomerulosclerosis. Hyperlipidemia can potentially accelerate progression of renal disease by several mechanisms. First, reabsorption of fatty acids, phospholipids, and cholesterol contained in the filtered proteins (albumin and lipoproteins) by tubular epithelial cells can stimulate tubulointerstitial inflammation, foam cell formation, and tissue injury. Second, accumulation of lipoproteins in glomerular mesangium can promote matrix production and glomerulosclerosis. In this context, native and oxidized lipoproteins, particularly LDL, stimulate production of matrix proteins by cultured mesangial cells and promote generation of proinflammatory cytokines, which can lead to recruitment and activation of circulating and resident macrophages. In addition, impaired HDL-mediated reverse cholesterol transport can further contribute to tissue injury by limiting the unloading of the excess cellular cholesterol and phospholipid burden. In fact, low plasma HDL has been identified as an independent risk factor for progression of renal disease. Moreover, hereditary LCAT deficiency, which is associated with a marked reduction in HDL cholesterol and impaired HDL-mediated reverse cholesterol transport, results in progressive renal disease. It is of note that both chronic renal insufficiency and nephrotic syndrome lead to acquired LCAT deficiency and impaired HDL metabolism. Correction of these abnormalities by ACAT inhibitor administration has been shown to reduce proteinuria and retard progression of renal disease in experimental animals. In addition to the animal studies, a number of clinical studies have provided evidence for the potential contribution of dyslipidemia in progression to renal disease. For instance, the Physicians Health Study demonstrated a significant increase in the risk of deterioration of renal function among individuals with mildly elevated baseline serum creatinine who had elevated serum cholesterol and/or reduced HDL cholesterol concentrations. Similarly, the Modification of Diet in Renal Disease (MDRD) study identified low plasma HDL cholesterol as an independent risk factor for progression of renal disease. Together, these observations have prompted a limited number of clinical trials exploring the effect of lipid-lowering agents in humans with chronic kidney disease (CKD). The value of lipid-lowering therapies on the progression of renal disease in humans remains uncertain and requires further investigation. The risk of cardiovascular morbidity and mortality is profoundly increased in patients with CKD. For instance, the majority of patients with CKD die of cardiovascular events before reaching ESRD. Moreover, cardiovascular mortality among dialysis-dependent ESRD patients is 10- to 30-fold greater than in the general population despite stratification for gender, age, race, and the presence of diabetes. Numerous factors contribute to atherogenic diathesis and the high risk of cardiovascular disease in CKD. These include oxidative stress, inflammation, hypertension, and altered metabolism of lipids, carbohydrates, nitric oxide, calcium, and phosphate, among others. In a group of 135 patients with CRF, containing 58 severe predialysis, 36 on dialysis and 41 renal transplant. The primary causes of the disease has the highest percentage for glomerulonephritis and diabetic nephropathy. In Table 8.3. we have several lipid data and they are significantly increased with major changes in TG, CRP and tHcy, which relate also to the metabolic syndrome. In Table 8.4. we have in the same study the relationship between the plaque scores and CAD risk factors in CRD. There is a significant relationship between the score and LDL-c also to age and duration of hypertension and no relation to tHcy. In Table 8.5. There were data on carotid IMT measurements and plaque scores. There were no differences in the three groups and controls for IMT. There is however a significant change in plaque score against control but similar in the three groups and the score is highest in the pre-dilaysis group. Table 8.4. Carotid plaque score and CAD risk factors in CRF. The plasma cholesterol concentration is frequently elevated in patients with nephrotic proteinuria and mild to moderate renal insufficiency, it is frequently normal or reduced and only occasionally elevated in those with ESRD. Accordingly, the high risk of cardiovascular disease in ESRD populations cannot be attributed to hypercholesterolemia. On the contrary, a reduction in plasma cholesterol (which denotes intense inflammation) predicts cardiovascular events, in contrast to the pattern in the general population. However, the paradox of plasma total cholesterol by no means diminishes the participation of lipid disorders as a culprit in this process. Instead, accumulation of oxidation-prone atherogenic lipoprotein remnants and impaired HDL-mediated reverse cholesterol transport (Figure 8.1.) which are the defining features of uremic dyslipidemia, may play a major part in the pathogenesis of atherosclerosis in this population. CRF results in profound dysregulation of several key enzymes and receptors involved in the metabolism of lipoproteins, particularly those of HDL and triglyceride-rich lipoproteins. Downregulation of LCAT, apoA-1, and hepatic lipase together with upregulation of CETP are largely responsible for the reduction in HDL cholesterol and elevation of HDL triglyceride in CRF. Down regulation of skeletal muscle and adipose tissue LPL, hepatic lipase, and the VLDL receptor and of hepatic LRP is collectively responsible for hypertriglyceridemia, impaired clearance, and elevated plasma levels of VLDL, IDL, and chylomicron remnants despite down regulation of hepatic triglyceride synthetic capacity. Dysregulation of lipid metabolism can contribute to atherogenic diathesis and possibly to progression of renal disease and impaired energy metabolism in CRF. Figure 8.1. HDL interactions and interconversion in CRD. Tsimihodimos V, Dounousi E, Siamopoulos K. C. Dyslipidemia in Chronic Kidney disease: An approach to pathogenesis and treatment. Am J Nephrology 2008;28:958-73. Orth S R, Ritz E. The Nephrotic Syndrome. New Eng.Journ. Medicine, 1998;338:1202-11. Rose B. D., G. B. Appel. Hyperlipidemia in nephritic syndrome and renal failure. UpToDate, April,2006. Wu-Wong JR. Endothelial dysfunction and chronic kidney disease: Treatment options. Curr. Opin. Investig Drugs 2008;9(9):970-82. Ceska R, Tesar V. Diabetes, dyslipidaemia and kidney diseases. Vnitr Lek 2008;54(5):511-7.